American test pilot mission specialist astronaut 1998-2010. Status: Inactive; Active 1998-2010. Born: 1957-03-29. Spaceflights: 2 . Total time in space: 26.56 days. Birth Place: Columbus, Ohio. Grew up in Wadsworth, Ohio. US Navy test pilot. PERSONAL DATA: Born March 29, 1957 in Columbus, Ohio. His hometown is Wadsworth, Ohio. Married to the former Lorrie Dancer of Oklahoma City, Oklahoma. They have three children. Recreational interests include golf, home repair/improvement, working out and spending time with his family. His mother, Nancy C. Foreman, resides in Wadsworth, Ohio. His father, James W. Foreman, is deceased. Lorrie's mother, Pat Dancer, resides in Tulsa, Oklahoma. Her father, James L. Dancer, is deceased. EDUCATION: Graduated from Wadsworth High School, Wadsworth, Ohio, in 1975; received a Bachelor of Science Degree in Aerospace Engineering from the U.S. Naval Academy in 1979, and a Master of Science in Aeronautical Engineering from the U.S. Naval Postgraduate School in 1986. ORGANIZATIONS: Association of Naval Aviation, United States Naval Academy Alumni Association, Association of Space Explorers. AWARDS: �Legion of Merit, Defense Meritorious Service Medal, Meritorious Service Medal, Navy Commendation Medal, Navy Achievement Medal and various other service awards. SPECIAL HONORS: Graduated with Distinction, U.S. Naval Postgraduate School; Admiral William Adger Moffett Aeronautics Award, U.S. Naval Postgraduate School; Distinguished Graduate, U.S. Naval Test Pilot School; Empire Test Pilots School-sponsored award for best final report (DT-IIA), U.S. Naval Test Pilot School. EXPERIENCE: Foreman was designated as a Naval Aviator in January 1981, and assigned to Patrol Squadron 23 at NAS Brunswick, Maine. Following this tour, he attended the U.S. Naval Postgraduate School in Monterey, California, where he earned a Master of Science in Aeronautical Engineering in 1986. As a graduate student, Foreman conducted thesis research at the NASA Ames Research Center in Mountainview, California. Following graduation, he was assigned as the Assistant Air Operations Officer on the USS CORAL SEA (CV 43) homeported in Norfolk, Virginia. Upon selection to the U.S. Naval Test Pilot School (USNTPS) in 1989, he moved to NAS Patuxent River, Maryland. He graduated from USNTPS in June 1990, and was assigned to the Force Warfare Aircraft Test Directorate. In 1991, he was reassigned as a Flight Instructor and the Operations Officer at USNTPS. During his tenure there, he instructed in the F-18, P-3, T-2, T-38, U-21, U-6 and X-26 glider. In 1993, Foreman was assigned to the Naval Air Systems Command in Crystal City, Virginia, first as the Deputy and then as the Class Desk (Chief Engineer) Officer for the T-45 Goshawk aircraft program. Following that tour, he returned to NAS Patuxent River, this time as the Military Director for the Research and Engineering Group of the Naval Air Warfare Center Aircraft Division. In addition to his duties at Patuxent River, he was assigned as the Navy liaison to NASA's Advanced Orbiter Cockpit Project at the Johnson Space Center. 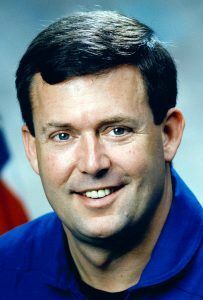 Foreman was working as the Technical Lead for the Advanced Orbiter Cockpit Project team when he was selected for the Astronaut Program. He retired from the Navy in June 2009. Foreman has logged over 7,000 hours in more than 50 different aircraft. NASA EXPERIENCE: Selected by NASA in June 1998, he reported for training in August 1998. Astronaut Candidate Training included orientation briefings and tours, numerous scientific and technical briefings, intensive instruction in shuttle and International Space Station systems, physiological training and ground school to prepare for T-38 flight training as well as learning water and wilderness survival techniques. He was initially assigned technical duties in the Astronaut Office Space Station Branch, where he represented the Astronaut Office on training issues. He was then assigned to the Space Shuttle Branch as a liaison between the Johnson Space Center and the Kennedy Space Center and also served as Deputy of the Space Shuttle Branch. Foreman also served as Chief of External Programs at Glenn Research Center, Ohio, from June 2010 to May 2011. Foreman is currently assigned as the Safety Branch Chief in the Astronaut Office. He also supports the Exploration Branch, working on the Commercial Crew Development Program. A veteran of two space flights, Foreman flew on STS-123 in March 2008, and STS-129 in November 2009, and has logged more than 637 hours in space, including 32 hours and 19 minutes of EVA in five spacewalks. SPACEFLIGHT EXPERIENCE: STS-123 Endeavour (March 11 to March 26, 2008) was a night launch and landing. It was the 25th shuttle/station assembly mission. Endeavour's crew delivered the Japanese Experiment Logistics Module - Pressurized Section, the first pressurized component of Japanese Aerospace Exploration Agency's (JAXA's) Kibo Laboratory and the final element of the station's Mobile Servicing System, the Canadian-built Dextre, also known as the Special Purpose Dextrous Manipulator. While on the station, Foreman performed three spacewalks for a total of 19 hours and 34 minutes of EVA. The STS 123 crew also delivered Expedition 16 Flight Engineer Garrett Reisman, and returned to Earth with the European Space Agency's (ESA's) Léopold Eyharts. The mission was accomplished in 250 orbits of the Earth, traveling more than 6.5 million miles in 15 days, 18 hours, 10 minutes and 54 seconds. STS-129 (November 16 to November 29, 2009) was the 31st shuttle flight to the International Space Station. During the mission, the crew delivered two Express Logistics Carriers (ELC racks) to the space station, about 30,000 pounds of replacement parts for systems that provide power to the station, keep it from overheating and maintain proper orientation in space. During the mission, Foreman performed two spacewalks for a total of 12 hours and 45 minutes of EVA. The STS-129 mission was completed in 10 days, 19 hours, 16 minutes and 13 seconds, traveling 4.5 million miles in 171 orbits, and returned to Earth, bringing back with them NASA's Nicole Stott, following her tour of duty aboard the station. Born March 29, 1957 in Columbus, Ohio. His hometown is Wadsworth, Ohio. Married to the former Lorrie Lee Dancer of Oklahoma City, Oklahoma. They have three children. Recreational interests include golf, running, skiing, home repair/improvement and spending time with his family. His mother, Nancy C. Foreman, resides in Wadsworth, Ohio. His father, James W. Foreman, is deceased. Her parents, Jim and Pat Dancer, reside in Tulsa, Oklahoma. Graduated from Wadsworth High School, Wadsworth, Ohio in 1975; received a bachelor of science degree in aerospace engineering from the U.S. Naval Academy in 1979 and a master of science degree in aeronautical engineering from the U.S. Naval Postgraduate School in 1986. Society of Experimental Test Pilots, Association of Naval Aviation, United States Naval Academy Alumni Association. Navy Commendation Medal; Navy Achievement Medal and various other service awards. NASA Certificate of Recognition for Technical Brief (1987). Graduated with Distinction, U.S. Naval Postgraduate School; Admiral William Adger Moffett Aeronautics Award, U.S. Naval Postgraduate School; Distinguished Graduate, U.S. Naval Test Pilot School; Empire Test Pilots School-sponsored award for best final report (DT-IIA), U.S. Naval Test Pilot School. Foreman graduated from Annapolis in May 1979 and was commissioned as an Ensign in the United States Navy. He went on to pilot training in Pensacola, Florida and Corpus Christi, Texas and was designated a Naval Aviator in January 1981. After initial training in the P-3 Orion aircraft in Jacksonville, Florida, he was assigned to Patrol Squadron Twenty-Three at NAS Brunswick, Maine. He made deployments to Rota, Spain; Keflavik, Iceland; Lajes, Azores; Sigonella, Sicily; Bermuda and Panama. Following this tour he attended the U.S. Naval Postgraduate School in Monterey, California where he earned a Master of Science degree in Aeronautical Engineering in 1986. As a graduate student, Foreman conducted his thesis research at the NASA Ames Research Center in Mountainview, California. Following graduation he was assigned as the Assistant Air Operations Officer in USS CORAL SEA (CV-43) homeported in Norfolk, Virginia. In addition to his Air Operations duties, he flew as an E-2 pilot with VAW-120 and VAW-127. Upon selection to the U.S. Naval Test Pilot School (USNTPS) in 1989 he moved to NAS Patuxent River, Maryland. He graduated from USNTPS in June 1990 and was then assigned to the Force Warfare Aircraft Test Directorate at Patuxent River as the P-7 Project Officer. In 1991 he was reassigned as a flight instructor and the Operations Officer at USNTPS. During his tenure there he instructed in the F-18, P-3, T-2, T-38, U-21, U-6 and X-26 glider. In 1993, Foreman was assigned to the Naval Air Systems Command in Crystal City, Virginia, first as the deputy, and then as the Class Desk Officer for the T-45 Goshawk aircraft program. Following that tour he was again assigned to NAS Patuxent River, this time as the Military Director for the Research and Engineering Group of the Naval Air Warfare Center Aircraft Division. In addition to his duties at Patuxent River, he was assigned as the Navy liaison to the Advanced Orbiter Cockpit Project at the Johnson Space Center. Foreman was working as the technical lead for the Advanced Orbiter Cockpit Project team when he was selected for the astronaut program. He has logged over 3,000 hours in more than 50 different aircraft. Selected by NASA in June 1998, he reported for training in August 1998. Astronaut Candidate Training includes orientation briefings and tours, numerous scientific and technical briefings, intensive instruction in Shuttle and International Space Station systems, physiological training and ground school to prepare for T-38 flight training, as well as learning water and wilderness survival techniques. Following a period of training and evaluation, Foreman will receive technical assignments within the Astronaut Office before being assigned to a space flight. Family: Astronaut. Country: USA. Spacecraft: ISS. Flights: STS-120A, STS-123, STS-129. Agency: USN. Bibliography: 12, 5396. 1957 March 29 - . Birth of Michael James Foreman - . Nation: USA. Related Persons: Foreman. American test pilot mission specialist astronaut 1998-2010. 2 spaceflights, 26.6 days in space. Flew to orbit on STS-123 (2008), STS-129..
2004 February 19 - . STS-120 (cancelled) - . Crew: Foreman, Halsell, Lawrence, Poindexter, Sellers, Wilson. Nation: USA. Related Persons: Foreman, Halsell, Lawrence, Poindexter, Sellers, Wilson. Agency: NASA. Program: ISS. Flight: STS-120A. Spacecraft Bus: Shuttle. Spacecraft: Endeavour. Flight delayed after the Columbia disaster. STS-120 was to have flown ISS Assembly mission ISS-10A. It would have delivered to the station the second of three station connecting modules, Node 2. With this mission the redefined ISS US Core would have been completed. 2008 March 11 - . 06:28 GMT - . Launch Site: Cape Canaveral. Launch Complex: Cape Canaveral LC39A. LV Family: Shuttle. Launch Vehicle: Space Shuttle. STS-123 - . Call Sign: Endeavour. Crew: Behnken, Doi, Foreman, Gorie, Johnson, Gregory H, Linnehan, Reisman. Payload: Endeavour F21 / Dextre, Kibo ELM-PS. Mass: 118,950 kg (262,230 lb). Nation: USA. Related Persons: Behnken, Doi, Foreman, Gorie, Johnson, Gregory H, Linnehan, Reisman. Agency: NASA. Program: ISS. Class: Manned. Type: Manned spaceplane. Flight: Soyuz TMA-11, STS-122 ISS EO-16, STS-123, STS-123 ISS EO-16. Spacecraft Bus: Shuttle. Spacecraft: Endeavour. Duration: 15.76 days. Decay Date: 2008-03-27 00:40:41 . USAF Sat Cat: 32699 . COSPAR: 2008-009A. Apogee: 346 km (214 mi). Perigee: 341 km (211 mi). Inclination: 51.60 deg. Period: 91.40 min. Endeavour's main task was delivery of the Canadian Dextre robotic manipulator (fitted to the end of the Canadarm-2 robotic arm already installed on the station) and the Japanese Kibo ELM-PS Experiment Logistics Module - Pressurized. It also brought astronaut Reisman to the station, replacing Eyharts on the long-duration crew. The orbiter was placed in an initial 58 km x 220 km orbit at main engine shutdown, adjusted by the OMS-2 firing 38 minutes later to a 220 km x 233 km chase orbit. On 13 March the shuttle docked with the PMA-2 port of the International Space Station at 03:49 GMT. Mission accomplished, Endeavour undocked at 00:25 GMT on March 25, completed the customary ISS flyaround at 01:36 GMT, deorbited at 23:33 GMT the next day, and landed at 00:39 GMT at Kennedy Space Center. EVA STS-123-4 - . Crew: Behnken, Foreman. EVA Duration: 0.27 days. Nation: USA. Related Persons: Behnken, Foreman. Program: ISS. Flight: Soyuz TMA-11, STS-123. The crew replaced a power control box on the station truss and carried out the T-RAD experiment, repairing a sample damaged heat shield tiles using a putty-like material..
EVA STS-123-5 - . Crew: Behnken, Foreman. EVA Duration: 0.25 days. Nation: USA. Related Persons: Behnken, Foreman. Program: ISS. Flight: Soyuz TMA-11, STS-123. The crew completed installation of the MISSE 6 sample exposure experiment; assisted in the installation of the OBSS arm, used to inspect the underside of the Shuttle, on the Station truss. The crew finally made inspections of the damaged Solar Alpha Rotary Joint, required to develop a future repair method. STS-123 MCC Status Report #33 - . Nation: USA. Related Persons: Behnken, Doi, Eyharts, Foreman, Gorie, Johnson, Gregory H, Linnehan, Reisman. Program: ISS. Flight: Soyuz TMA-11, STS-122 ISS EO-16, STS-123, STS-123 ISS EO-16. 2008 March 27 - . 00:39 GMT - . Landing of STS-123 - . Return Crew: Behnken, Doi, Eyharts, Foreman, Gorie, Johnson, Gregory H, Linnehan. Nation: USA. Related Persons: Behnken, Doi, Eyharts, Foreman, Gorie, Johnson, Gregory H, Linnehan. Program: ISS. Flight: STS-122 ISS EO-16, STS-123. 2009 November 19 - . EVA STS-129-1 - . Crew: Foreman, Satcher. EVA Duration: 0.28 days. Nation: USA. Program: ISS. Flight: Soyuz TMA-15, Soyuz TMA-16, STS-129. Installed a spare antenna on the station's truss and a bracket for ammonia lines on the Unity module. Lubricated the grapple mechanism on the Payload Orbital Replacement Unit Attachment Device on the Mobile Base System and lubricated the snares of the han. 2009 November 21 - . EVA STS-129-2 - . Crew: Bresnik, Foreman. EVA Duration: 0.26 days. Nation: USA. Program: ISS. Flight: Soyuz TMA-15, Soyuz TMA-16, STS-129. Installed the GATOR (Grappling Adaptor to On-Orbit Railing) bracket to the Columbus laboratory and an additional ham radio antenna. Installed on the truss an antenna for wireless helmet camera video. Relocated the Floating Potential Measurement Unit that .